Newsroom - Sacramento agent's instinct saves children from online predator - American Airlines Group, Inc. When American officially signed ECPAT-USA’s Tourism Child-Protection Code of Conduct (The Code) last month, it was a formal recognition of our longstanding commitment to help frontline team members identify and report signs of human trafficking. As the world’s largest airline, we play an important role in this effort. 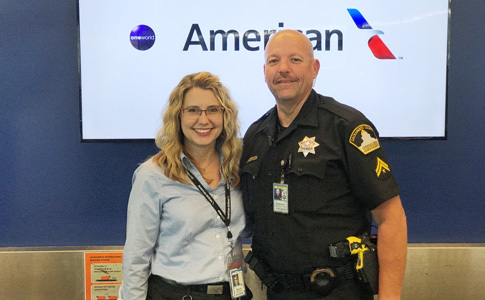 For Sacramento, California (SMF) Customer Service Agent Denice Miracle, a normal Thursday afternoon late last summer evolved into a jarring example of how quickly two young lives could have been forever changed, were it not for a decision to let suspicion drive action. Shortly after 3 p.m., two girls — one 17, the other 15 — approached the ticket counter to check in for a flight. There were immediate red flags: There was no adult with them; they had no identification; the tickets were one-way and multi-leg; they were booked in First Class; and the credit card used to reserve their seats was in neither of their names. In fact, it was flagged as fraudulent. Denice told the girls they wouldn’t be able to fly, so they walked away and sat down at a nearby table. One made a phone call. Denice called the Sacramento County Sheriff’s Department Airport Bureau and explained the situation. It would prove to be a life-altering decision. Four deputies responded, and the story they describe in their written summary of the incident is haunting. The girls met a man they knew as "Drey" on Instagram. He invited them to New York for the weekend to earn $2,000 doing some modeling and performing in music videos. Without their parents’ knowledge, they went to the airport. They told deputies they believed their tickets were round-trip. When the deputies shared that the tickets were in fact one-way, the girls were described as "shocked." And remember how one of them got on the phone after Denice said they couldn’t fly? Deputies later discovered it was “Drey” on the other end — for the last time. Attempts to call him back failed. His Instagram profile disappeared. Just like that, the man these girls trusted to fly them across the country for some work and quick cash had vanished. Deputies reached the girls’ parents and told them they believed the girls to be victims of attempted human trafficking. Thankfully this story ends with them both returning home safely — in large part because of an alert team member who saw something and said something.